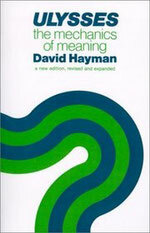 Hayman, David. Ulysses: The Mechanics of Meaning. Rev. ed. London: The University of Wisconsin Press, 1982. Patrick Parrinder. James Joyce. Cambridge: Cambridge UP, 1984. Benstock, Bernard. James Joyce. New York: Frederick Unger Publishing Co., 1985. 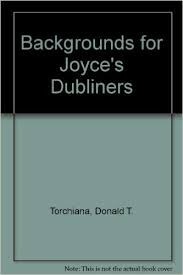 Torchiana, Donald T. Backgrounds for Joyce’s Dubliners. Boston: Allen & Unwin, 1986. Nadel, Ira. 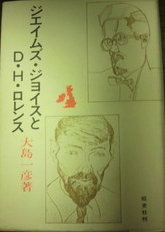 B. Joyce and the Jews: Culture and Texts. London: Macmillan Press, 1989. 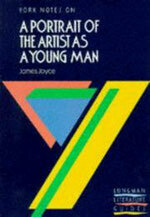 There is no book like Ulysses, and no book about Ulysses like this one. In the years since it was published in 1922, Joyce’s masterpiece, at first banned amid cries of outrage, has emerged by common consent as the indispensable imaginative work of the century. Nothing in English since Paradise Lost has so altered our sense of man, of man’s world, and of literature itself. 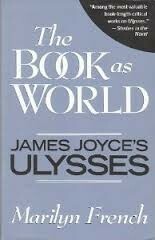 Meanwhile all manner of ancillary works have proliferated: defenses, attacks, beginners’ guides, expositions of symbolic content, annotations, efforts to relate Ulysses to its author’s life or to the traditional novel. Mr Kenner’s book is none of these. It concentrates on the way Joyce himself teaches us to read Ulysses as he taught himself to write it: moving from the simple to the forms compatible with the world of Picasso and Einstein, but anticipating every complex proxedure with easy examples furnished early. Ulysses is a book that cannot be read, only reread, and each rereading somewhat alters our sense both of Ulysses and of the act of reading. Throughout, Mr Kenner emphasis the factuality on which Joyce expended such pains. He has new things to say on a wide variety of topics, including the Homeric parallels, the slow erosion of novelistic stereotype by minute information, the role of styles in the book’s latter half, the enigma of its ending. Hugh Kenner’s many books include Dublin’s Joyce (1956) and Joyce’s Voices (1978). He is Andrew W. Mellon Professor of the Humanities at The Johns Hopkins University, Baltimore. 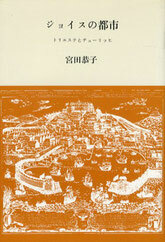 Each volume in the Unwin Critical Library deals with a single work of literature. The aim of the series is to offer interpretation and information at a high level of reliability and interest. Asked by an artist friend whether his day-long struggle to write two sentences of Ulysses was due to his search for the mot juste, James Joyce replied, "No, I have the words already. What I am seeking is the perfect order of words in the sentence. There is an order in every way appropriate." In the first book-length study of the syntax of Ulysses, Roy K. Gottfried analyzes the appropriateness―the art―in the novel's rich variety of sentence patterns. Underlying the varieties of style that the reader encounters from chapter to chapter and even from character to character, there is, the author shows, a single unifying strategy. The syntax of Ulysses is shown to be a consistent manipulation of word-order, recognizable in a variety of different applications and ranging in intensity from rigid adherence to that order to nearly asyntactic freedom. 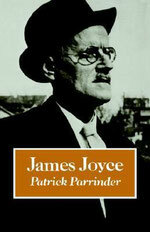 The ultimate appropriateness of Joyce's syntax lies in its relation to his novel's meaning. Making the first thorough application yet of Joyce's dualism, the author demonstrates the close relation between the syntax and the tention in the novel between order and freedom. 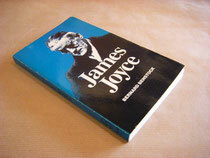 In close analyses of sentences ranging from the most conventional in grammar and syntax to the most dislocated, he unfolds the novel's dialectic, proving that, at least for Joyce, style is substance. Roy K. Gottfried is assistant professor of English at Vanderbilt University. CHAPTER 3　WELCOME, O LIFE! JJBN: 1981-COSTELLO: Costello, Peter. 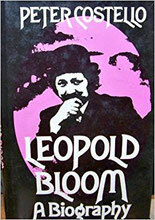 Leopold Bloom: A Biography. Dublin: Gill and Macmillan, 1981. Traces the life of the fictitious main character of Joyce's Ulysses and project what his life would have been like after the day covered by the novel. This book offers a fresh interpretation of what is perhaps one of the most controversial novels of the twentieth century. Based on a careful stylistic examination of the novel, this reading will force a thorough reconsideration of current critical thinking about Joyce's work. Marilyn French has taught English literature at Hofstra College, Harvard University, and the College of the Holy Cross, and is the author of The Woman's Room and The Bleeding Heart, publushed by Sphere Books. A welcome new overview of Joyce’s work – here is the Irish writer assessed from the standpoint of the 1980s, as his stature and influence in today’s world are examined afresh by a distinguished specialist. 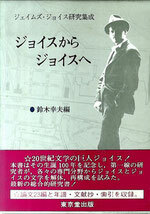 Through analyses that cut to the core of the Joyce canon (including the poems), the reader is introduced to the intricacies, unique style, and fundamental aspects of narrative distinguishing each of the major works. A separate chapter on Exiles, a play often relegated to a position of less importance, clearly demonstrates its true significance. Discussions of the formidable masterworks, Ulysses and Finnegans Wake, are especially lucid and thorough. This new study is a fully up-to-date assessment of Joyce’s work, and an important addition to Joyce criticism. 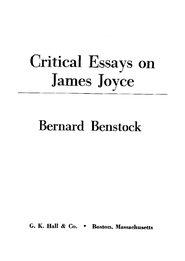 BERNARD BENSTOCK is past president of the James Joyce Foundation and the author and editor of several books on Joyce and other subjects, as well as a contributor to Ungar’s Encyclopedia of World Literature in the 20th Century. He is Professor of Comparative Literature and Chairman, Faculty of Foreign Languages and Comparative Literature, The University of Tulsa. JJBN: BENSTOCK,ed-1985: Benstock, Bernard, ed. Critical Essays on James Joyce. Boston: G. K. Hall, 1985. Ezra Pound, "Dubliners and Mr James Joyce"
T. S. Eliot, "Ulysses, Order, and Myth"
Edmund Wilson, "The Dream of H. C. Earwicker"
Samuel Beckett, ''Dante ... Bruno. Vico .. Joyce"
Stuart Gilbert, "The Rhythm of Ulysses"
Frank Budgen, "Joyce's Chapters of Going Forth by Day"
Richard M. Kain, "Talking about Injustice: James Joyce in the Modern World"
Richard Ellmann, "The Backgrounds of 'The Dead'"
Hugh Kenner, "The Cubist Portrait"
Clive Hart, "The Elephant in the Belly: Exegesis of Finnegans Wake"
Fritz Senn, “Book of Many Turns"
Robert Boyle, S.J., "Miracle in Black Ink: A Glance at Joyce's Use of His Eucharistic Image"
Bernard Benstock, " 'The Dead': A Cold Coming"
David Hayman, "Nodality and the Infra-Structure of Finnegans Wake"
Thomas F. Staley, "A Beginning: Signification, Story, and Discourse in Joyce's 'The Sisters' "
Wolfgang Iser, "Doing Things in Style: An Interpretation of 'The Oxen of the Sun' in James Joyce's Ulysses"
Margot C. Norris, "The Consequence of Deconstruction: A Technical Perspective of Joyce's Finnegans Wake"
Shari Benstock, ''Nightletters: Woman's Writing in the Wake"
Introduction: "O, Rocks. . . . Tell Us in Plain Words"
6　The Concept of Artistic Paternity in "Scylla and Charybdis"
9　Metaphoricity in "Eumaeues" and "Ithaca"
In this major study of Ulysses, Daniel R. Schwarz not only presents a powerful and original reading of Joyce's great epic novel, but discusses it in terms of a dialogue between recent and more traditional literary theory. 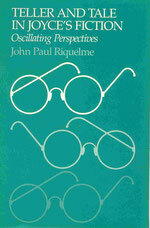 He takes full account of Gabler's 'Ulysses': A Critical and Synoptic Edition. 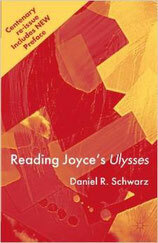 Focusing on what he calls the odyssean reader, Schwarz demonstrates how the experience of reading Ulysses involves both responding to traditional plot and character as well as to the novel's stylistic experiments. Schwarz show how the novel creates a reader who must make subtle and deliberate discriminations in his odyssean journey through the novel. After three splendid general chapters which address, respectively, how Joyce's art signifies, Joyce's concept of the hero, and the role of the reader, Schwarz provides an episode-by-episode analysis. Daniel R. Schwarz is Professor of English at Cornell University. He is he author of The Humanistic Heritage: Critical Theories of teh English Novel from James to Hillis Miller, Conrad: 'Almayer's Folly' to 'Under Western Eyes,' Conrad: the Later Fiction, and Disraeli's Fiction. His essays on critical theory and on Victorian and twentieth century British literature frequently appear in collections and important journals. With his customary wit and erudition, one of America's most celebrated and distinguished critics examines the response of literary Modernism to environmental changes caused by technology. 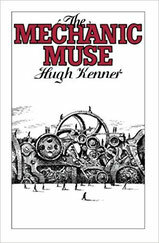 Focusing on Eliot, Pound, Joyce, and Beckett, Hugh Kenner explores how inventions as various as the linotype, the typewriter, and the computer altered the way these writers viewed and depicted the world. Hugh Kenner is Professor of English at The Johns Hopkins University and author of many books, including A Colder Eye: The Modern Irish Writers, The Pound Era, and The Invisible Poet: T.S. Eliot. 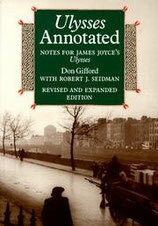 Here substantially revised and expanded, Don Gifford’s annotations to Joyce’s great modern classic comprise a specialized encyclopedia that will inform any reading of Ulysses. 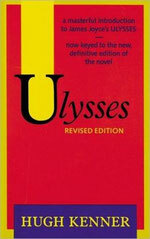 Annotations in this edition are keyed both to the reading text of the new critical edition of Ulysses published in 1984 and to the standard 1961 Random House edition and the current Modern Library and Vintage texts. Gifford has incorporated over 1,000 additions and corrections to the first edition. 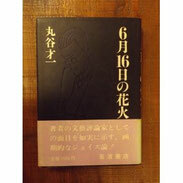 The introduction and headnotes to sections provide general geographical, biographical, and historical background. The annotations gloss place names, define slang terms, give capsule histories of institutions and political and cultural movements and figures, supply bits of local and Irish legend and lore, explain religious nomenclature and practices, trace literary allusions and references to other cultures. the suggestive potential of mirror details was enormously aspect of his literary method. The annotations in this volume illuminate details which are not in the public realm for most of us. Don Gifford was Emeritus Professor of English at Williams College at his death in 2000. 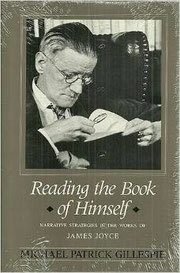 Joyce and the Jews is the first systematic study of the identity and causes of James Joyce's association with Jews. Using biographical and historical information, as well as Joyce's texts and critical theory, the book argues that the margiality of exclusion experienced by European Jews transformed them into a crucial analogu of Joyce's life. 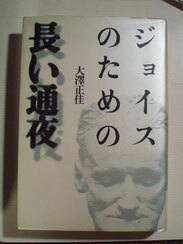 The book also shows taht the essential Judaism of Joyce is textual: in his Kanguage Joyce enacts the principles and texhniques of Rabbinical hermeneutics and Judaic Textuality. As Jews knew and Joyce learned, the world was their promised land, and the text their homeland. Preceeding Joyce's encounter with text was his exodus from ireland which initiated which an identity with the disclocated Jew. As the book documents, it is no coincidence that Joyce's career and attitude towards text relates to his increasing affinity with Jews whose lives often merged with his own. Ira B. Nadel is Professor of English at the University of British Columbia. He is the author of Biography: Fiction, Fact and Form and editor (with Shirley Newman) of Gertrude Stein and the Making of Literature and (with Peter Buitehuis) of George Orwell: A Reassessement.